Back in 2008 I would spend some of my Saturday afternoons sitting in a Laundromat, waiting for my clothes to smell good. I quickly realized these moments were perfect to bring my laptop with me and code. One of the first AIR apps I wrote was Shrink O’Matic, now you know where the name comes from. It quickly became successful. It now has been downloaded 168,000+ times, a best-seller of sorts. Except it's free. But with success comes feedback, and with feedback comes feature suggestions. Most of them were included through updates, some of them didn't make the cut. Probably because of me being lazy or because of AIR's limitations. Then AIR 2 came out, then I learnt Robotlegs... So I re-wrote it from scratch! Introducing Shrink O’Matic 2, the same quick and simple app but with more features and a nicer theme. Drop folders onto the app: every image in it (or in its sub-folders) will be shrinked. New "Rotation" settings pane: either use a specific angle or let the app read your images' EXIF data and decide what to do. Custom name option: choose exactly what the output name will be using your own pattern and injecting the original file's name (using $name) and/or its position in the queue (using $num). PNG files now keep their transparency when shrinked. Watermark: watermark your images, even choose where to place the overlay. Drop files onto the app while it's processing, no problemo! But! I decided some features had to go. I removed the "name preview" that used to be in the status bar. I also removed the ability to drop images from web pages. If you need these features and want them back, make sure to drop a comment and let me know! That's it, go get it! Posted on January 21, 2012 under Dev,Visual. This post is tagged air, as, flex, photo, yellow	and has 97 comments. Sorry but no, you currently can’t do that! 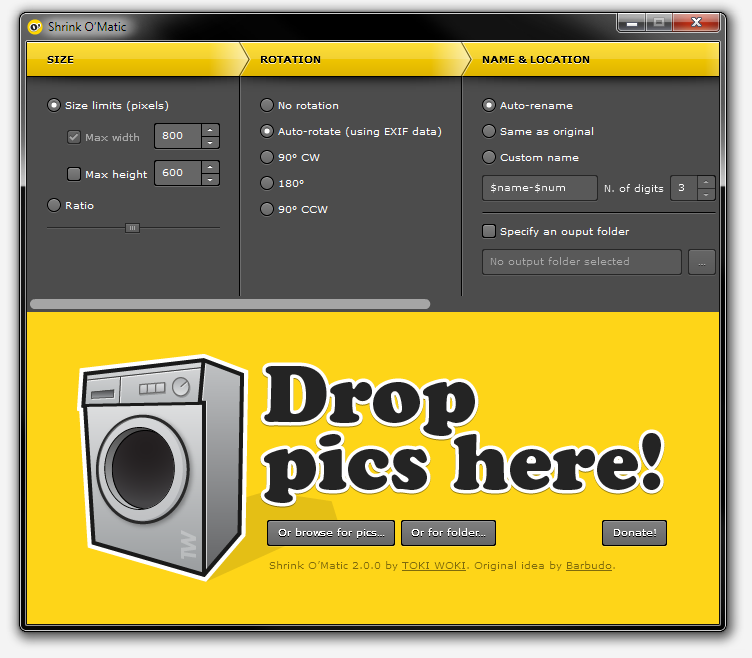 Hi, Im using shrink o’matic since for a long time now but since i updated to 2.0.3, only one photo is generated. I’ve also downloaded the latest version from this site but still same result. what could be the problem? Hi. Please, add option to preserve EXIF data. Thanks in advice. Been using for years, always without problem and always executed perfectly. Today, twice received a data execution prevention error. Has something changed in the programming? Hi DMac, could you send me more details? I thought the issue only surfaced when, after selecting the folder I wanted to use, I opened a second window to grab the pix I wanted. At that point the program would fail and the following info was obtained. “Shrink-O-Matic.exe has stopped working. A problem caused the program to stop working correctly. Windows will close the program and notify you if a solution is available. Then after clicking on “CLOSE” a second window opened which read “Shrink-O-Matic.exe was closed. To help protect your computer, Data Execution Prevention has closed Shrink-O-Matic.exe. Click to learn more. After rebooting, I again opened the program and this time I simply moved the opening splash screen and the program again closed because of DEP. That was also my first thought…unfortunately when I tried that I received an error that essentially stated that SOM must run with DEP enabled. I’m beginning to think that an update to Adobe Air may be the culprit. Dragging photos directly from browsers is not working in Windows 8.1. Can you look onto it? Just tried Shrink O’Matic, and the Custom Name option doesn’t work, as it doesn’t add the number of digits at the end of filenames. Anyone else having that issue? Hi Tim, what did you write in the Custom name field? If you put $name-$num it should work (just tried it)! Ah, that worked. I was not aware of the $num attribute. Thank you. Very Very Nice work!!! Simple install Clean look Works like a charm! I have installed this before no problem but the last two times ive tried to install on fresh win 8 systems through chrome i get the following error “The application could not be installed because the installer file is damaged. Try obtaining a new installer file from the application author.” Happening on two brand new win 8 installs on two different machines. Any idea what could be causing this? Have you tried downloading the AIR file directly and running it? Hiya :) I like this app, but like E-vance I’ve noticed that some PNGs actually become bigger, and in my case even twice as big. Is there any hope for a fix after 2 years? amazing app…I want to translate it to russian…When can I send messages? Installed the app yesterday and everything worked wonders. Today, all of a sudden, it doesn’t read folders. @photogrist: If you want to you can send your translations to my e-mail address (click contact at the bottom of this page)! Are you drag-and-dropping the folder, or selecting it after clicking on the Browse button? WOW it really gets the job done. I just wish it showed a log of what it had done, such as what the savings in file size was for each file. The program is excellent, it saves me a lot of time with wonderfull results. Only one thing that I found annoying, when you put a watermark in a lot of images with various sizes the watermak appears with various sizes among the images. The ideal result would be to have the watermark in the same size in all the images. Very happy with the app. Might just be me, but it stopped working after the last AIR update. This is awesome apps.. It’s been 2 years, any updates? just updated my adobe air last night…notice that it doesn’t compressed images as good as it was.. Sorry about this… Can you share more details? I can’t reproduce that. I had an issue with the second last Air update (OSX). App would begin to launch and then silently abort. I left it over xmas but finally chased up another update at the Air site yesterday and that seemed to fix it.. Anyway, it *could* have been an issue limited to my specific install – corrupted install etc – but just flagging it in case others hit a similar problem. I’ve got a 50MB jpg that it doesn’t want to resize. Why does not work for some files? Sorry I tried to open the file in Photoshop and it complains of an ‘invalid or unknown jpeg marker’. So maybe that’s why. Perhaps something can be done to skip the bad file because right now when it encounters a file like that it stops the whole batch process. Good idea; will see if I have time to do that! Hi Quentin, first of all, found this app recently and really like it! I have a small feature request. If you can add $width and $height variables to the custom naming that uses the actual width and height of the output file, that’d expand the ease of use a lot for batching! Thanks! Great idea! Will see if I can implement this, thanks! Just a shout out to you, Quentin. Great little app that does one job perfectly. Thanks for your work on it. I’ve uploaded the new version here, but in order for it to work you’ll have to uninstall your current version and install this one. Sorry about that! Love your app, but I’ve run into the following error “The application could not be installed because the installer file is damaged. Try obtaining a new installer file from the application author.” It’s happened once before, on another computer. I just got a brand new Windows 10 machine and getting this error. Any idea why? Self-signed means “you have to trust me when I say I’m the author of the app”, but that’s pretty much it. Nothing to worry about if you see warning when installing it. You will have to uninstall any previous version, though.